Site restoration was completed on the North Kedron Brook Sewer Protection Project in mid-September 2015. 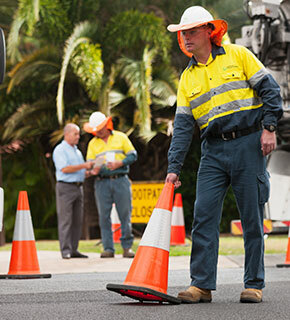 The last stage of works, involving construction on a sewer maintenance hole and a length of pipe in Kedron Brook near the Wattle Street and Fern Street cul-de-sacs, Enoggera, started on Friday 6 July 2015 and finished in late July 2015. Some tree trimming occurred to access sewerage infrastructure, and Queensland Urban Utilities worked with Brisbane City Council and local bushcare groups to minimise impacts on vegetation and organised offset plantings. Queensland Urban Utilities has completed work on the North Kedron Brook Sewer Protection Project, a capital investment to protect and extend the operational life of sewerage infrastructure located in the Kedron Brook waterway. The project reinforced and replaced five sewer maintenance holes and three sewer pipes along this 3.3km sewer line which starts near South Pine Road and the Wattle Street cul-de-sac, Enoggera and follows the alignment of Kedron Brook through Grinstead Park, Alderley, through Grange Forest Park to Grange Road, Grange.